(Washington, D.C.) – A delegation of NATE leaders, consisting of personnel ranging from tower technicians, foremen, company owners and Association executives, participated in a 5G technology themed event today at the White House in Washington, D.C. The NATE members were invited to participate by President Donald Trump, FCC Chairman Ajit Pai and key officials at the White House. FCC Chairman Ajit Pai utilized the occasion of the event to provide an update on the agency’s 5G FAST plan and make two major FCC announcements that will positively impact both 5G technology and rural broadband deployments. First, Chairman Pai announced that the FCC plans to start the process to move towards conducting the largest spectrum incentive auction in American history later this year. The auction will include new millimeter (MM wave) frequency spectrum bands that are vital for the industry to access for future 5G deployment. Second, Chairman Pai announced that the FCC is moving forward to develop a $20 billion Rural Digital Opportunity Fund with the goal of closing the digital divide by bringing broadband connectivity to rural areas of the country. 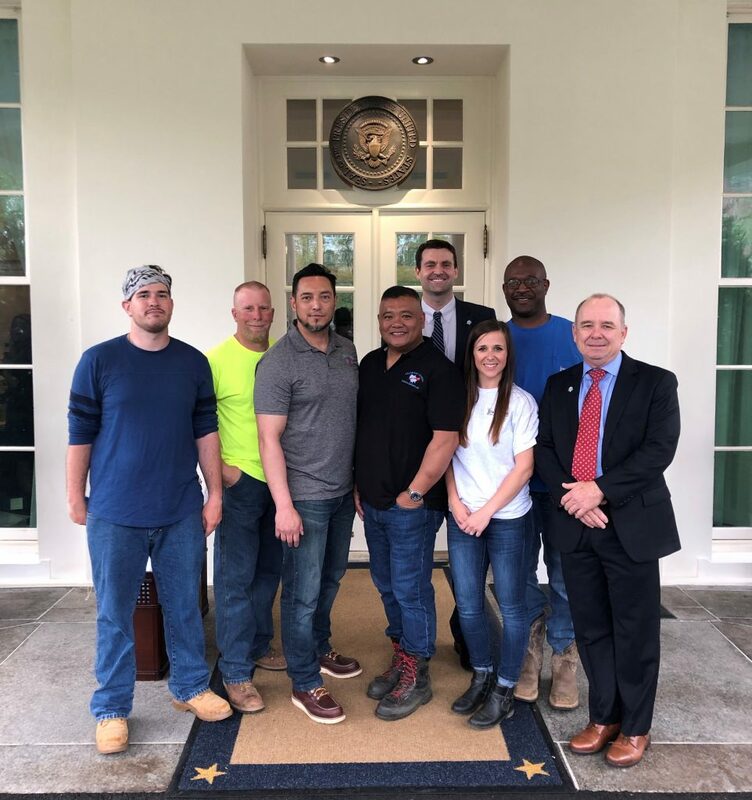 “I would like to thank President Trump and the White House staff for the opportunity to participate in today’s event,” said Carlos Church, Lead Tower Technician at MillerCo, Inc. in Gulfport, Mississippi. “It was an honor to stand by the President during his address and listen to his speech on 5G. This is an experience I will never forget,” added Church. “NATE applauds President Trump, FCC Chairman Pai and other top Administration officials for their leadership and commitment in advancing policies to ensure that the United States positions itself to win the competitive race to 5G,” stated Chairman Jimmy Miller. 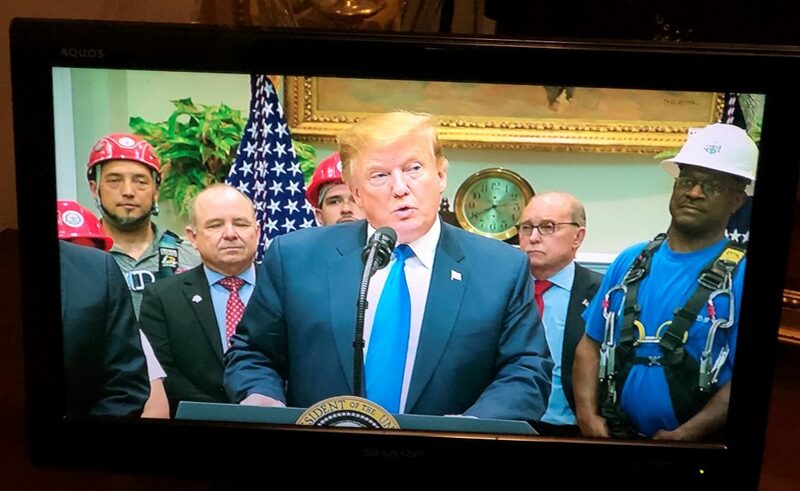 “The President’s remarks hit close to home as NATE member companies have deployed every generation of wireless networks and are currently on the front lines densifying networks as part of this crucial 5G deployment phase. NATE members also share the President’s goal of expanding broadband and related network infrastructure to rural and underserved areas and in fact our companies are doing this work on a daily basis right now,” Miller said. “It was very encouraging to witness President Trump and Chairman Pai utilize the platform of today’s festivities to pay homage to the workforce by sharing the stage with them,” said Executive Director Todd Schlekeway. “A safe and skilled tower technician workforce are the most precious assets available to the industry and expanding this pipeline of workers will be key to maintain America’s premier position in wireless. It is great to know that NATE and President Trump share common synergies and mutual goals related to workforce development and the Association is committed to working alongside the Administration to develop additional training pathways and programs necessary to expand the industry’s labor force pool,” Schlekeway added. For more information on today’s event, visit www.whitehouse.gov and www.fcc.gov. To learn more about NATE, visit www.natehome.com. National Association of Tower Erectors (NATE) is a non-profit trade association in the wireless infrastructure industry providing a unified voice for tower erection, service and maintenance companies. Today the Association boasts over 875 member companies located throughout the United States, Australia, Bahamas, Canada, China, Israel, Jamaica, Nigeria, Philippines, Puerto Rico, Saudi Arabia, Singapore, Spain, Trinidad and the United Kingdom. For additional information on NATE, please visit www.natehome.com.